Leadership, like most things, comes to some people more easily than others. But here’s the good news: whatever your natural abilities, you can learn to be a leader if you take the time to practice a few fundamental skills. As you apply these skills over time, you grow in effectiveness as a leader. Exercise authenticity with self. Identify your ethical code, and never compromise on what you believe to be right and wrong. It isn’t always easy to live authentically. At times, being true to what you know is right means going against the crowd. As an authentic leader, you have to be willing to look at yourself honestly and take criticism well, using it to improve your performance. Practice effective communication. A great leader is a great communicator. Learn to effectively use a number of different communication strategies to pass along your vision and values, share inspiration, and give clear commands—all while being transparent with information and open to feedback. Apply emotionally intelligence. A skilled leader is able to master and manage emotions. They don’t get angry in stressful situations. Instead, they have the ability to look at a problem and calmly find a solution. Work to develop a high degree of emotional intelligence by knowing yourself well, understanding and overcoming your emotional triggers, and staying attentive to the emotional needs of those around you. Generate a positive outlook. It’s easy to be positive when things are going well, but a skilled leader is able to remain confident when things go wrong. Learn to embrace failures and inspire your team and those around you to consider every circumstance, good and bad, as an opportunity to learn. A positive outlook will encourage others and create an environment where people want to remain. Positive thinking and positive action go hand in hand. Admit mistakes even if you’re afraid of looking weak. A skilled leader readily admits mistakes. When you do, you show your human side and gain respect. When you’re candid and honest about your own mistakes, your employees feel safe admitting theirs, helping to create a humanized, accepting, open culture. Be a role model others want to emulate. As a leader, your actions set the tone and the standard for appropriate behavior in the workplace. Exhibit actions that you want your team to emulate. You can establish rules of conduct to help people understand expectations, but the best way to encourage the behavior you want to see is to correctly and precisely demonstrate it yourself. Lead from within: To be the leader you want to be, practice and master the skills that will improve your leadership. 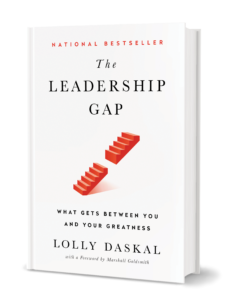 The post 6 Easy Habits That Will Help You Become the Leader You Want to Be appeared first on Lolly Daskal.